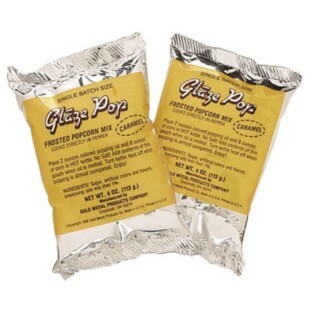 4-oz foil pouches of caramel glaze for perfect caramel popcorn every time. Produces light caramelized popcorn in your kettle in one step process. 4-oz. foil pouches of caramel glaze for perfect caramel popcorn every time! Produces light caramelized popcorn in your kettle in one step process. 48 pouches per case. Loved This Carmel Pop Corn Glaze! Our resident and staff members would stand in line for our popcorn when we used the camel glaze!